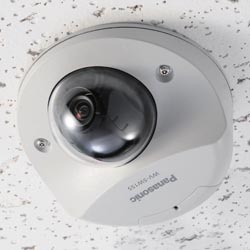 Dimensions: (H X W X D): 5-3/4" x 7-17/32" x 6-15/32"
The Panasonic WV-SW558 vandal-resistant dome is part of a series of 1080p network video surveillance cameras that simultaneously deliver both full HD images and 360p images. 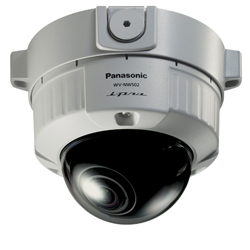 Enclosed in a IP66-rated water- and dust-resistant dome, the camera uses a 2.8-10mm 3.6x varifocal auto-iris lens. 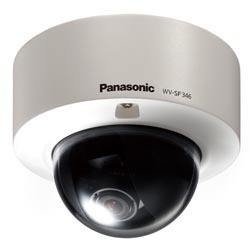 Panasonic’s UniPhier® S newest generation LSI processor provides simultaneous cropping of whole and part images, lower bandwidth storage requirements, more VIQS zones, dual H.264 streaming capability and overall higher-level functionality. VIQS (variable image quality on specified areas), combined with efficient compression, enables network bandwidth reduction of 50 percent by decreasing the image quality for less important areas in a video frame (such as the sky), while retaining image quality for critical parts of the view. Face detection analytics detect the position of a human face and send the information by video stream. Face Super Dynamic Range ensures clear face images. Cropping function enables whole images (1,920 x 1,080) and parts of an image (640 x 360) simultaneously. 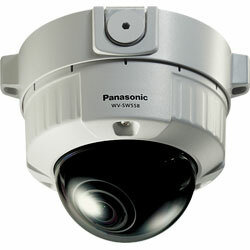 Up to 4 image capture areas can be specified, and it is also possible to control the sequence. Super high resolution at Full HD / 1,920 x 1,080 via 3.1Megapixel high sensitivity MOS Sensor. Face Super Dynamic Range technology ensures clear images of the face. 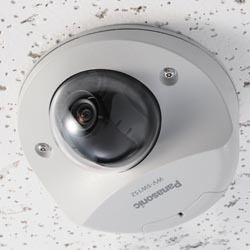 Using Panasonic distinctive LDC (Lens Distortion Compensation) function, images without distortion can be monitored though using wide angle lens. Superior color reproduction via primary (RGB) color filter. Face detection function detects the presence and position of a human face and the information is sent by video stream.